It seemed like not long-ago Gigabyte released its Aorus branding to compete with the likes of Asus ROG or even Dell’s Alienware, While some might see it as another way for manufacturers to fragment and possibly overprice its already existing market the Aorus branding actually allowed Gigabyte to expand its market with a much more memorable brand. 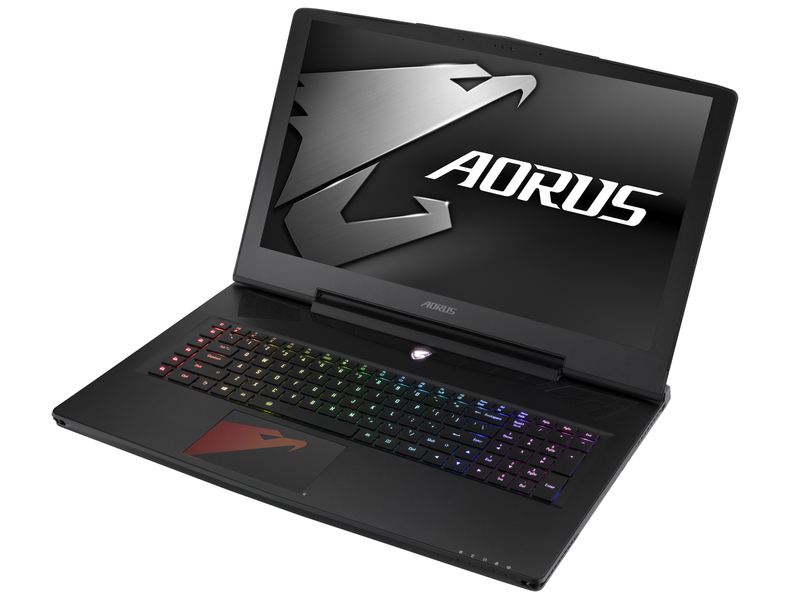 With that said what does the current Aorus X7 v7 have to offer? Matter of fact a slimmer high-performance device. Under the hood the Aorus X7 v7 sports an Intel Core i7-7820HK processor with 16 GB of memory, 1256GB of storage split between a 1TB HDD and 256GB SSD setup and a Nvidia Geforce GTX 1070 graphics processor. Of course, all of this would be useless without a properly designed chassis. And 17-inches of it the Aorus X7 v7 has, at a glance users can see that Gigabyte has redesigned the chassis to be much more sleeker with mesh grilles below the left and right hinges which helps with airflow thus keeping its internals well ventilated. In terms of chassis material the Aorus X7 v7 is made out of brushed aluminium which allows the notebook to stay somewhat light for its class but still rigid enough to maintain its shape without flexing too much. Over to the IO section Gigabyte has revised its ports which now includes 2 USB type C gen 2 ports with one of them supporting Thunderbolt 3, a HDMI 2.0 port, 1 mini Display 1.3 port, 4 USB 3.1 Type A ports and your usual Ethernet and audio jacks. One thing to note here is while the SDcard reader isn’t something to hoot about it is actually one of the fastest of its kind. Next on the checklist would be the display which has a native resolution of QHD, Gigabyte does offer an additional 4K panel option should the user so desire. Both offered panels does have a 120hz refresh rate with G-Sync support which is more than a welcomed bonus then again considering this is Gigabyte’s flagship Aorus. While the panels perform well in gaming, It doesn’t do so well in color reproduction with sRGB ratings of only 87% and AdobeRGB ratings of only 57% suffice to say if you are a content creating gamer you should look elsewhere. Overall gaming performance the Aorus X7 v7 is powerful enough to handle all current games smoothly and handles heat well without throttling, this may be attributed to its large size which in turn allows for a much more beefier cooling system. As for the audio department, the speakers remain quite loud but lacks bass which does decrease from audio punchiness. However, when it comes to highs and mids there wasn’t any noticeable deterioration of sound quality. This means audio quality is about above average. Naturally with a beast like this power consumption is going to be high this means battery life is going to take a beating with the Aorus X7 v7 scoring a mere 3 hours on Wi-Fi which is lower than the average but still higher than a desktop replacement notebook. Users should set their expectations accordingly when carrying this notebook around although at 17 inches you might be hard pressed to find a decently large bag to fit it. Final words being from the outside the Aorus X7 v7 seem similar to its predecessor but has some actual improvements although in terms of processor improvements they are about minor.